The Virtual Terminal is an online version of a credit card machine. A virtual terminal is a software application that does for an online store what a credit card or point-of-sale machine does for a brick-and-mortar store. It allows you to manually enter a customer’s credit card information from a phone, mail, or fax order into a web-based payment form. You then can use the information to process the transaction electronically just as if they’d directly placed their order online. eMerchant Gateway’s Virtual Terminal is hosted directly on our secure servers and can be accessed anywhere you have an internet connection. You just have to log into your account through our website and you’ll immediate be able to key in customer’s information and authorize transactions. You can enter orders one-by-one, or batch-upload a number of transactions at once to save time. You’ll also be able to create and prepare a number of customized reports that can be emailed, downloaded and printed at any time. You can even use our virtual terminal to conduct an in-person transaction. Simply plug in a USB credit card reader, and when you swipe your customer’s card, it will automatically enter their card number and expiration date without needing to manually key it in. This ecommerce software has a number of other features and customization options to help you effectively manage secure transactions. You’ll also get personalized one-on-one service with frequent communication to make sure you’re getting the most out of your virtual terminal. Whether you’re just getting your ecommerce sales up and running or are ready to take your business to the next level, we’re here for you every step of the way. Manually key in and authorize transactions from mail, fax or phone order sales. Refund orders directly to a customer’s credit card. Hosted on eMerchant Gateway’s secure servers. 24/7 access from any computer or mobile device with a web connection. 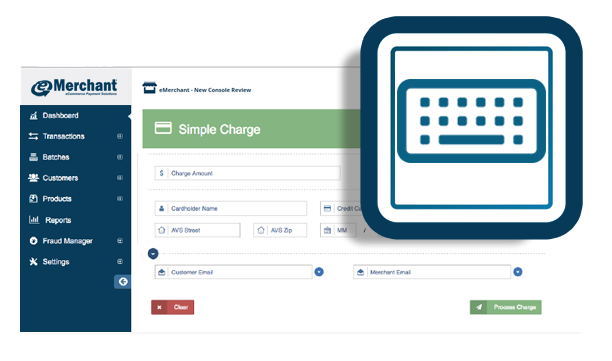 Automatically bill customers for recurring charges on a daily, weekly, monthly, bi-monthly, quarterly, bi -annually, or annual basis. Scan customer’s credit card information directly using a USB card reader. Batch-upload transactions from CVS or tab limited files. Check order statuses and run a variety of reports that can be printed, emailed, or downloaded from any location with a web connection.